The new ARROW ID 5000 is truly the ultimate bowhunter’s rangefinder for real world bowhunting situations. 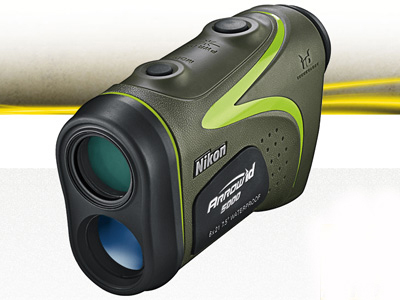 This rangefinder features Nikon’s legendary multicoated optics, waterproof/fogproof ruggedness, pocket-sized portability, long eye relief, Tru-Target Priority System, and Nikon’s ID (Incline/Decline) Technology. Designed for those who are serious about bowhunting, the ARROW ID 5000 gives you the horizontal distance to the target so that you can overcome even the most severe upwards or downwards angles – up to a near-vertical +/- 89 degrees. It delivers the one number you need to make the shot with laser speed and trust-inspiring accuracy. The one number you need to take the shot is easy to find, thanks to the uncluttered LCD display of the ARROW ID 5000. At the simple push of a button, the distance will appear in .1-yard increments all the way out to 600 yards. The ARROW ID 5000 conveniently fits in a pocket or a pack, and can be worn on a belt without interfering with your shot. At just 6.2 ounces (without batteries), it’s light enough to not weigh you down. Plus, it’s comfortable to carry and use all day long in any of the toughest situations your hunt can present. The ARROW ID 5000 is packed with features that are designed to make your life easier. From a simple, single button control to the large 18mm ocular, the rangefinder is very user-friendly. It also features 8 seconds of continuous measurement so that you can scroll across a landscape and pick out the distances of various landmarks. For the diehard bowhunter who sticks it out rain or shine, this is one rangefinder that is made to tough it out with you. The ARROW ID 5000 is Nitrogen filled and O-ring sealed for waterproof and fogproof performance in even the wettest conditions.